Simple Sightings from Our Customers! A couple months ago I received a phone call from one of our cute customers, Girlfriends Boutique in Twin Falls, Idaho. These girlfriends have a darling store, and a million ideas for our Simple Stories products! I recently visited their blog, and once again . . . fell in love! I am a sucker for any kind of letter project, so I immediately fell in love with these Harvest letters that Girlfriends Boutique created using our new Generations collection! Generations is one of my very favorite collections that we have released so far. The colors are rich and beautiful and perfect for fun fall projects like this one! The girlfriends are even getting their customers ready for the Christmas season with this fun and creative Christmas advent calendar using the 25 Days of Christmas collection. I especially love the cute accordion flowers they created with the different patterned papers. Thanks to Lisa and Michelle at Girlfriend Boutique for letting us share their fun classes on our blog. Remember if you are a store and you have some fun classes, let us know; we would love to share them, and you can always link your classes to our Facebook page. Here in the states, school is almost out for the summer! So, I thought it would be a perfect time to share some great ideas with you using our Elementary collection. Grab your notebook and your pencil, and let's get started! I really wanted to share this layout with you because so many people want to cut it apart this paper or they don't know what to do with it. When we created Simple Stories, we wanted to be able to make it easy to share your story, hence the journal page. So fun and so SIMPLE to do! Are you feeling overloaded yet with ideas??? Do you need some ideas for teachers gifts? Take a look at these fun notebooks by Mary Konow, I think the bookmark is a nice added touch, don't you? The Elementary kit makes it super fun and easy to create teacher gifts as well as an entire album of your child's school year. Don't forget to share your creations on our Facebook page; we love hearing from you and love seeing your creativity! At the Winter CHA show this past January we had the pleasure of meeting Debra Jennis from Pinecone Press. Not only do they have some great idea books, but they also offer some great kits! We were thrilled when Debra asked us to use the Destinations collection for her next Options kit. These kits are available through Pinecone Press, and they also sell them wholesale to retail stores! If you are interested in the kits please contact Pinecone Press by clicking here. Remember we are always looking for your ideas! If you have a great project you have created and want to share it with our readers, please email me at sales@simple-stories.com. We love to show off your creations that are made with our products! Make sure to stop by tomorrow to see what Liz has been up to . . . she has some fun projects she will be sharing tomorrow; especially if you want some fun ideas using our cut apart elements. Simple Sightings - Robbie, Stacy, Linda and Brenda! I am absolutely THRILLED to introduce one of our NEW blog segments from the Simple Stories home office – Simple Sightings! This is so exciting for me as I will be sharing some creative and inspiring ideas from YOU – our blog readers, customers and fans. I can not tell you how exciting it is when we see what you have done with our products – whether on blogs, websites, google searches, our Faceobook page… or even when you email us your creations. As a new company in the industry it still makes me so giddy when I see customers actually using OUR Simple Stories products in your projects…it’s an amazing feeling . Even better is when we hear how much you LOVE the design, love the products and how Simple Stories is helping you create beautiful albums, pages and projects…SIMPLY! So for my first Simple Sightings post I wanted to share with you some of the inspiring projects “spotted” using our Life Documented collection. 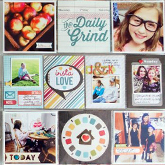 These layouts were created by Robbie Herring, who emailed us letting us know how excited she was about our products and how they are a perfect fit for her scrapbook style. I have to agree – she has created darling designs and I love her style! I love all of the details she put into both layouts from the stitching and the banners, the the layering and embellishments…DARLING!! Next is a very simple, yet beautiful card from Stacy Rogers. I did a google search one day…just curious to see what came up with searching Life Documented and this caught my eye immediately. I LOVE how simple this card it, yet so beautiful. It confirms everything I love about Simple Stories – beautiful, simplified design! I like how Stacy added a touch of glamour with the glittered die-cut heart...and the darling stamp. Who wouldn't love to get this card? Here's a darling layout the Linda Auclair posted to our Simple Stories Facebook fan page. I love how Linda made the focal photo of her layout really stand out with the cute little scalloped border sitcker (included in our Life Documented Fundamental stickers.) I also loved how she placed the florish under the photo and layered with other Life Documented elements...and of course I'm sucker for anything with banners! I also saw this fun card from Brenda Rose. I love how she incorporated stamps and used our predesigned elements in a creative way….again, so simple yet beautiful! She decorated the card with a handmade banner and decorative border punch! ...and I love the sentiment "...sending you a little happy!" This card definately makes me happy! Thank you Robbie, Stacy, Linda and Brenda for your creativity and inspiration. Now YOU go out and create something amazing....and let us see it! We're going to be scouring message boards, blogs, social media networks, etc. for more Simple Sightings. You can tweet, blog, and even upload your projects to our Simple Stories Facebook page. You can email us (sales@simple-storie.com), anyway you can share your creations with us...let us know! I'll be back next Thursday with more amazing projects from our viewers, customers and fans...who knows...it could be YOU!